Anti-lock brake systems (ABS) are used to prevent steering loss when wheels on the vehicle lock up and start to skid when brakes are applied and vehicle is still moving. ABS detects when a wheel is no longer turning and momentarily releases the brake on that wheel. ABS can release the brake as many times as is needed to enable the wheel to turn. On icy roads, when ABS is triggered, the brakes can be heard rapidly coming on and off as the ABS tries to release the wheel enough for the wheel to turn. Wet roads, excessive braking, ice, snow, loose road surface can all cause the wheels of a car, truck or van to lock up, causing the vehicle to go into a skid. When a skid happens, the driver is no longer steering the car via the usual methods since at least one of the wheels of the vehicle is no longer turning. While race car drivers are taught to steer a car while in a skid, most drivers do not have the skills or training to do this. If you car is older, you may not have ABS since at one point it was considered a luxury. If you have Traction control, then you have ABS. Look in your car owners manual or search online to see if your car has ABS. While most modern cars have ABS on all 4 wheels, some older vehicles only have it on 2 of the wheels. This was most common with vehicles that are rear wheel drive that may be used for towing. Unlike cars without ABS, hydraulic fluid for the brakes passes through an ABS module that controls braking. ABS modules allow pressure to be released from a brake momentarily if the wheel the brake is on stops turning. If air gets into the hydraulic fluid braking system it may get into the ABS module. Air compresses more than hydraulic fluid and can cause brake failure at moments when brakes are most needed leading to death or injury. To bleed the air out of the ABS module, the ABS module may need to be cycled which is done by a mechanic's computer instructing the ABS module to cycle during brake bleed. Mechanic's bleed brakes to get all the air out of the brake system. A mechanic doing a normal brake fluid bleed job such as after a brake line or wheel cylinder is replaced may not get all the air out of the ABS module if they do not cycle the ABS module. ABS module having air in it, may not be noticed until the ABS kicks in when a wheel goes into a skid. Vehicle with the problem may not stop or take longer to stop leading to a collision. Anti-lock Brake Control Module will have hydraulic fluid lines coming from the Brake master cylinder (brake pedal is connected to this) and additional hydraulic fluid brake lines going to each wheel with ABS. 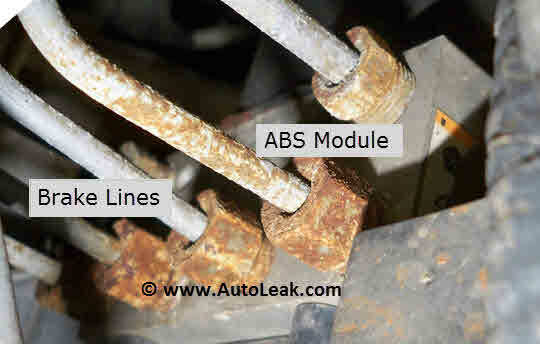 ABS Module will release pressure on the brake lines for each individual wheel that stops turning when brakes are applied and the vehicle is still moving. 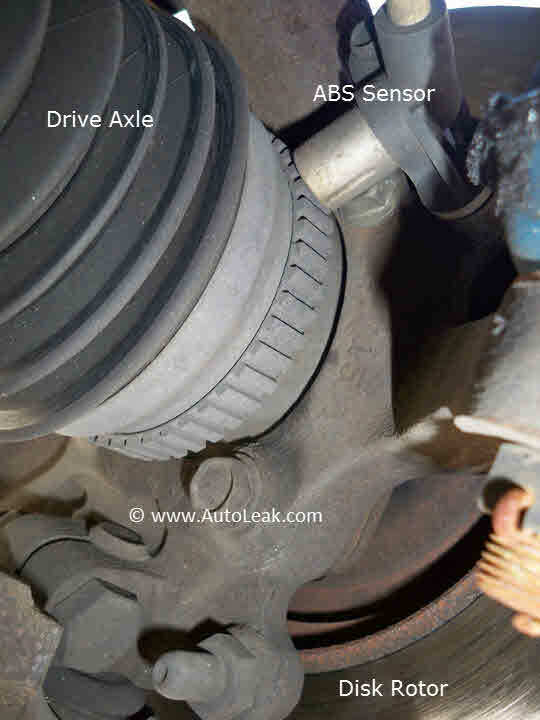 Whether it is a drive axle or freewheeling hub(not driven by engine), ABS sensor will be present to detect the rotational movement of the wheel if the wheel is part of the ABS system. More modern ABS use magnets as part of the axle or hub to show movement to the sensor. 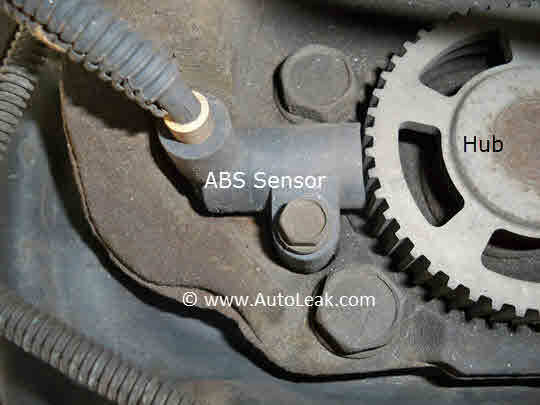 Corrosion of the ABS sensor can cause the ABS sensor to give false readings to the vehicle computer leading to delayed braking or loss of power as more systems than just brakes can use the input from the ABS sensor.